My officemate Kevin has been evangelizing Solarized for a while, so today I took the plunge and set it up, and man do I wish I had done this a while ago. Much of the content described below is straight from his setup - I definitely owe him. 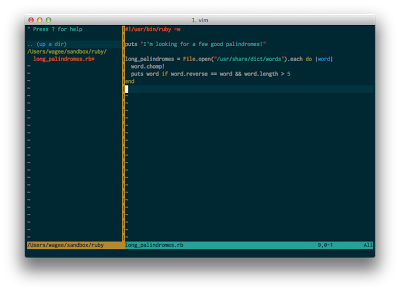 For more info see the iterm2-colors-solarized README. Follow these instructions from the pathogen github README to install pathogen. In the next step, we'll be using pathogen to install more bits.